Maybe my kids are weird but both of them love using drinking straws. So we had all the supplies we needed on hand for this little craft – nine straws and some clear tape. Before we got crafty, we read a wonderful book. Kyra Teis has done a beautiful job adapting Mozart’s opera The Magic Flute into a children’s story. I bought this off Amazon and am SO glad I did. Before we got into the story, we went through the cast of characters on the opening few pages. My son was already hooked – after all, there’s a wise and powerful sorcerer and an evil queen. Right there, he’d made up his mind that the story was going to be good. And it was! There’s a whimsy and wonder to the story that my son and I both loved. This book would be a winner for boys and girls alike. The first straw was set aside; it required no cutting. 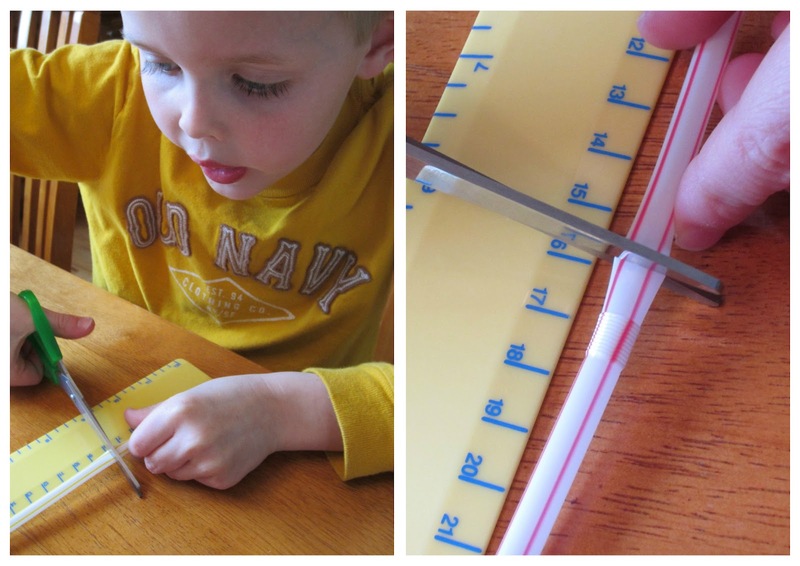 The second straw was lined up against the ruler and 2 centimeters were cut off the bottom. It was laid next to the uncut straw. The next straw, 2 more centimeter (i.e. 4 centimeters) was cut off. This process continued until 8 straws had been cut. Now my son laid a long piece of clear tape sticky side up on the table and lined the straws up longest to shortest, with the tops of each even with one another. Then he wrapped the tape around them. It was time to play our ‘magical’ flute! He blew over the tops of the straws! It truly DID seem like magic. The shortest straw made the highest note and the longest straw made the lowest. I gave him some writing paper and asked him to draw a picture of himself playing the flute and tell me what he’d do if his flute truly WAS magical. “I would play it for my brother to make him fall asleep,” he wrote. Since our youngest son has all but given up naps, I have to say, I think I’d play it if it could do that! Before we both moved on to other activities, my son and I watched a little bit of a performance of The Magic Flute on YouTube. We had fun trying to figure out which singers were what cast members. 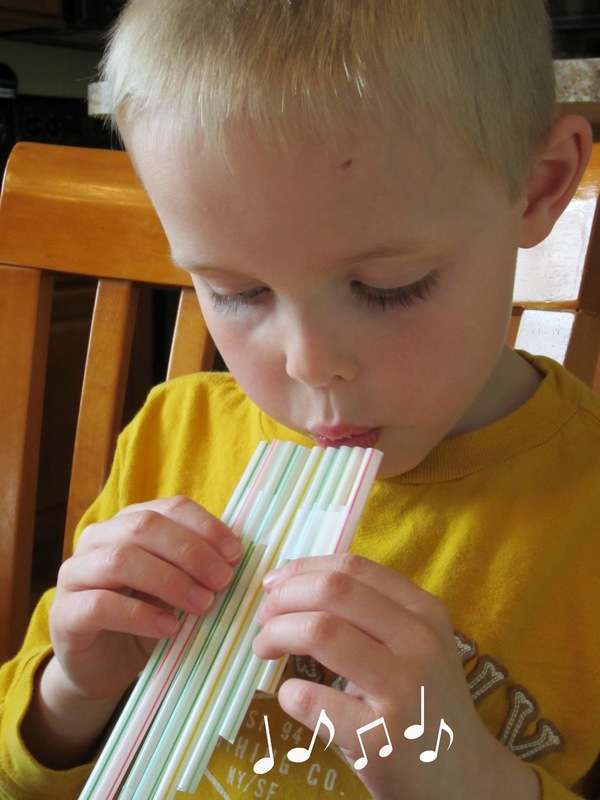 My 8 year old just asked me last week and again 15 minutes ago to put straws on the grocery list so she can make a flute! I sit down at the computer and this is the first thing I see! Love it! I can't wait to show her your post. I love the writing, book, and Magic Flute video. Great post! Hopping over from Classic Play. You elevated the whole project. Incorporating writing, music, math to make it a truly creative project? Absolutely FANTASTIC! PS I love the title of your blog. Genius. Very nice! I love your son's expression in the picture where he is playing it. I'll keep an eye out for this book! This is something I can let both of my children do. I like the educational aspects added to it. Great post! What fun! Your son looks like he is having a great time. You always come up with such neat ideas. Thanks for sharing them. What a great way to make literature come alive! I love the storytelling extension. For my son, I think I'd use the legend of the Pied Piper as he likes rats. I shudder to think of the story he'd come up with, though. I love this! I am going to pin this for use in the future! Great job! This is great! We ALWAYS have straws around. I am going to make this with the kids. Thanks! Found you via the Afterschool link up at Mama Smiles. This is such great idea! Pinned it and will be making it soon. Thanks for the inspiration. I'm following you from Toy's in the Dryer's Linky Party. Very great post! Hope you'll visit mine sometime: Kindergarten & Preschool for Parents and Teachers. I love this idea! Both my kidlets would have a blast! Thanks for the inspiration!! Cool idea. 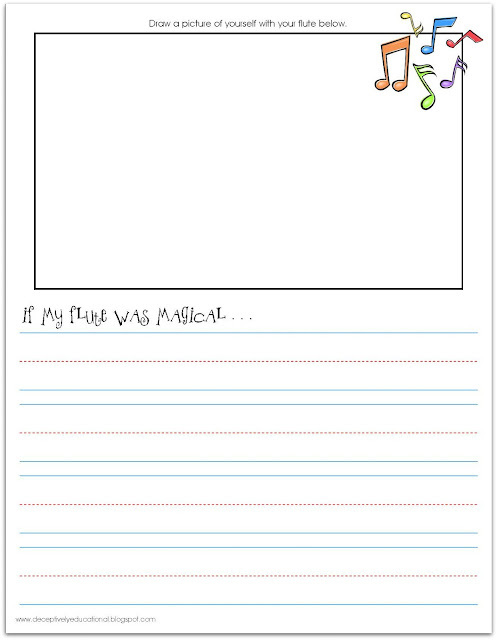 My son loves music and would get a real kick out of making this. This is AWESOME!! What a wonderful idea! You seriously have such amazing ideas! I am featuring this at TGIF tomorrow: http://livinglifeintentionally.blogspot.com/2012/04/tgif-linky-party-27.html - thanks for sharing your creativity with the rest of us!! Looking forward to seeing what you link up tomorrow! Oh, how fun!! I just sent a request to get the book from the library. We will definitely have to give this a try. We also just bought water flutes at Michaels for the bathtub. She loves them. Thank you for sharing at Sharing Saturday!! I hope you are having a fabulous week! Very cool! This is such a fun idea. Thanks for sharing at AfterSchool. How fun - great activity! Thanks for sharing on MYM last week!! I made this with my kids! They LOVE them!!! I blogged about it and linked back to you. Check it out, if you like! This is great! You incorporated literacy with math, music, writing, and science. I can see some children practicing measuring skills when they cut the straws. A great children's engineering activity too. Thank you for the writing paper! Just forwarded this to my sister-in-law, add my oldest nephew (12) has expressed an interest in panflutes. This looks like this is a perfect way for him to experiment with the basic instrument... Thanks for sharing! I made this with my kids the other day, but didn't get a good picture for my blog. You're tutorial and connected activities are awesome. 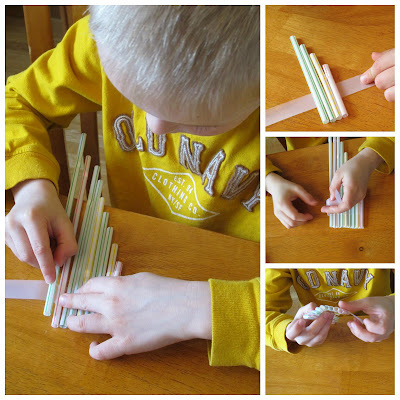 I would like to include it in a craft projects with straws round up on my blog. I'm so glad you tried this with your kids! I hope they enjoyed it as much as my son. Feel free to include the activity in your round-up. Thanks for asking, commenting, and following! Thanks so much for this great teaching idea. May I link to it on my site for other parents and teachers? By all means, Kyra, share away! Thanks for stopping by. I hope you'll find lots of great ideas here! My six year old daughter just loved this simple & awesome flute! The method was so easy that she could do it independently! also, she loved this different type of flute! she made everyone listen to it! 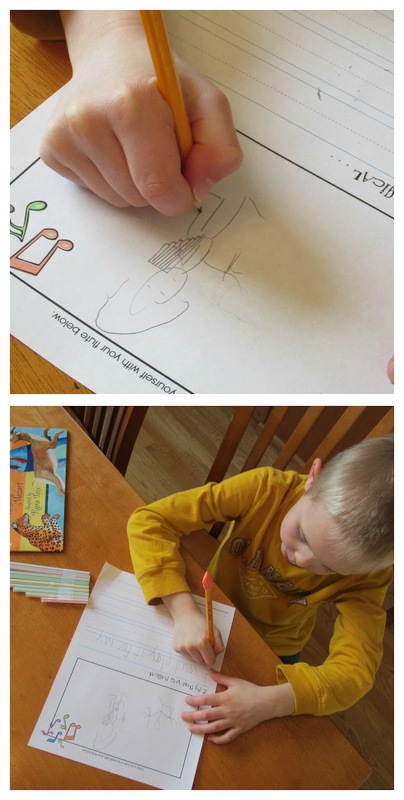 Very nice idea with a book, craft, and writing activity. I really want to try this too. I didn't know you could make a pan flute from drinking straws! It doesn't really make noise unless you seal the bottoms. At least, mine didn't. Any ideas on an efficient way to do this to many straws for a classroom?